Pope Leo X commissioned the painter Raphael in 1515 to create a series of designs for tapestries depicting the Acts of Saints Peter and Paul that were to be hung in the lower section of the Sistine Chapel. These preparatory tapestry designs are called cartoons, from the Italian word cartone, meaning large piece of paper, and among those painted by Raphael is one of Jesus commissioning Peter. Feed My Sheep, Raphael, 1515, preparatory cartoon for tapestry design, Victoria and Albert Museum, London. The scene is set at the shore of the Sea of Galilee, with the excited disciples greeting the risen Jesus on the shore. We can see the prow of the boat the disciples arrived in on the far right. Peter is kneeling before Jesus, who points to him with his left hand and at the sheep grazing in the background with his right. 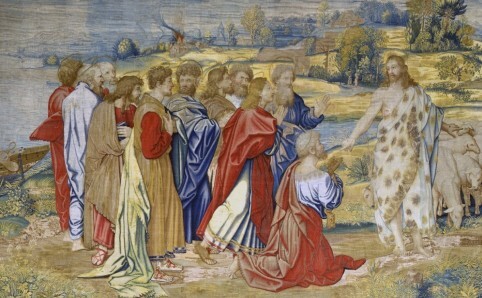 The commission was a novel combination of painting by an Italian Renaissance master with craftsmanship from the leading center for weaving, Flanders in northern Europe. The designs were woven in Brussels and the cartoons later found their way to England. The finished tapestry is reversed, due to the design transfer process, and lighter in color than the original cartoon. The cost of the project was more than five times what Michelangelo was paid to paint the ceiling of the Sistine Chapel because tapestry was considered a more prestigious art form at the time. Each cartoon is many separate squares of paper (each about 11″ x 16″) stuck together with a flour and water paste. This x-ray photo shows the lines of the separate pieces. 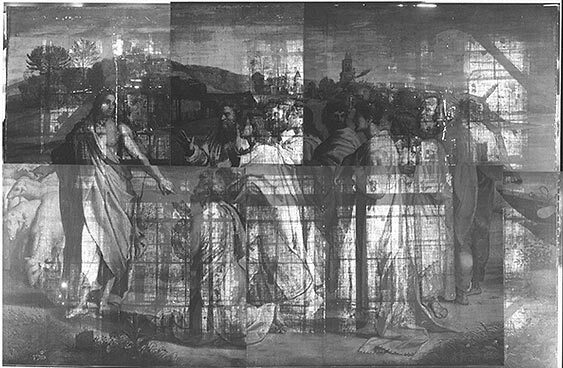 Use of infra-red reflectography on this image during recent conservation reveals buildings in the landscape that were not included in the finished painting. The design was then painted on with distemper, made of pigment, water, and animal glue. When the finished design was sent to the weavers, it was cut up into one-yard wide strips, and after the sections were woven they were stitched together into the final tapestry. Raphael’s cartoons were reused throughout Brussels by different weavers through the years and were eventually purchased at a low price for the British Royal Collection. In poor condition, they were reassembled and mounted in 1690. In 1865 Queen Victoria loaned them permanently to the Victoria and Albert Museum where they are displayed today. 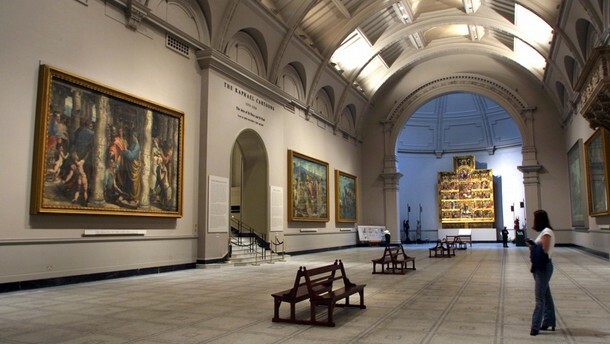 Raphael cartoons on display at the Victoria and Albert Museum. In 2010, four of the cartoons and tapestries, though not the subject discussed here, were briefly reunited for exhibitions that took place in both their original home in the Vatican’s Sistine Chapel and at the Victoria and Albert Museum. For further details on the history and conservation of the Raphael cartoons, visit these links to the Victoria and Albert Museum’s website. 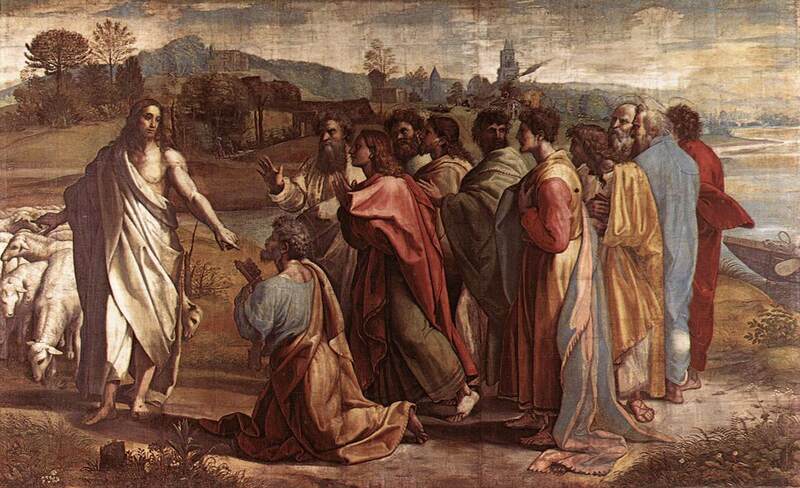 This entry was posted in Art, Bible and tagged art history, cartoons, Feed my sheep, Jesus, Raphael, Saint Peter, Sistine Chapel, Victoria & Albert Museum.